Zilla (ジラ, Jira), originally known as Godzilla, is a film monster originating from TriStar Pictures's Godzilla (1998). It was initially created as a reimagining of Toho's Godzilla but was later re-branded as a separate character. It was designed, by Patrick Tatopoulos, after marine iguanas with a slim theropod appearance as opposed to the bulky erect theropod designs of Toho's Godzilla. TriStar's Godzilla, both the film and character, were negatively received by fans and critics. Planned sequels were cancelled and an animated television series serving as a sequel was produced instead. TriStar's Godzilla featured in the 1998 film. In 2004, TriStar's Godzilla was featured in Toho's Godzilla: Final Wars as "Zilla". Afterwards, Toho (the owners of Godzilla) began trademarking new incarnations as "Zilla", with only the iterations from the 1998 film and animated show retaining the Godzilla copyright/trademark. The character has since appeared in other media as "Zilla". Toho's and Sony's trademarks for TriStar's Godzilla and Baby Godzilla. Initially, during production of Godzilla: Final Wars, director Ryuhei Kitamura asked producer Shōgo Tomiyama whether or not they were allowed to include TriStar's Godzilla in the film, whereupon Tomiyama checked Toho's contract with Sony and saw they were allowed to use it, Tomiyama stated: "Kitamura asked me if it was possible for us to use the American Godzilla in Final Wars, so I checked our contract with Sony Pictures and found out we could use it. Since this was the 50th anniversary film, I thought ‘Why not include the American Godzilla?'" This incarnation of TriStar's Godzilla was named "Zilla". This decision was made because they also felt that Emmerich's film had taken the "God" out of "Godzilla" by portraying the character as a mere animal. The name "Zilla" was chosen for the character by Tomiyama as a satirical take on counterfeit Godzilla products that use "Zilla" as a suffix. Toho's current trademark for future incarnations of TriStar's Godzilla. The "Zilla" name has since been trademarked by Toho and this name change has been reflected in subsequent official products featuring the character since 2004, though "Godzilla" continues to be used on products that predate the name change, such as home media re-releases of the 1998 film or Godzilla: The Series. 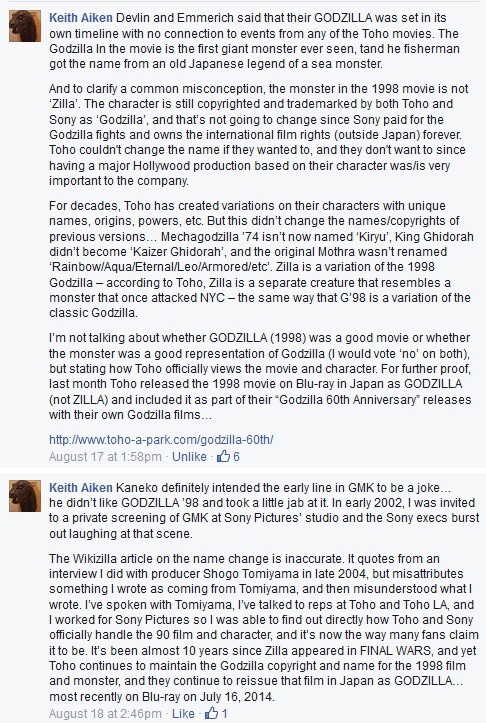 Matt Frank (co-writer and illustrator of Godzilla: Rulers of Earth) further clarified the name change, stating, "Toho makes zero distinction between "Zilla" and "Godzilla 1998" with the exception of title alone. Ever since 2004, Toho's official stance has been that any future incarnations of the character be referred to hereafter as 'Zilla'." Keith Aiken (co-editor of SciFi Japan) also clarified that "Zilla is a variation of the 1998 Godzilla" but stressed that only the incarnations from the 1998 film and the animated series retain the Godzilla copyright and trademark. Kurt Carley in the adult Godzilla suit. During the production of the 1998 film, special effects artist Patrick Tatopoulos was contacted by director Roland Emmerich and asked to create a new design for the Godzilla character. According to Tatopoulos, the only specific instructions Emmerich gave him was that it should be able to run incredibly fast. Emmerich intended to depict the character as an animal rather than a monster. Godzilla was originally conceived by special effects director Eiji Tsubaraya, special effects designers Akira Wantanabe and Teizo Toshimitsu and director Tomoyuki Tanaka as a robust, erect-standing, plantigrade reptilian sea monster, played by an actor in a rubber-latex full-body suit. Based on the instructions Emmerich gave him, Tatopoulos reimagined it as a lean, digitigrade bipedal iguana that stood with its back and tail parallel to the ground, rendered via computer animation. The monster's distinctive facial features include a prominent lantern jaw, inspired by the fictional tiger Shere Khan from Disney's animated adaptation of The Jungle Book. TriStar's Godzilla color scheme was designed to reflect and blend in with the urban environment. At one point, it was planned to use motion capture to create the movements of the computer-generated monster, but it ended up looking too much like a man in a suit. The Baby Godzilla scenes utilized a combination of CGI and purpose built costumes donned by actors. 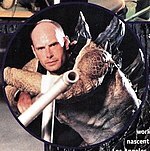 Kurt Carley portrayed the suitmation sequences for the adult Godzilla in the 1998 film while Frank Welker provided the sound effects for both the adult Godzilla as well as the Baby Godzillas. Upon pending approval for the design, at the time, Shōgo Tomiyama commented on the new look, saying "It was so different we realized we couldn't make small adjustments. That left the major question of whether to approve it or not." Though TriStar's Godzilla was referred to by the film's characters as a "he", Patrick Tatopoulos stated on a DVD audio commentary that the effects crew sculpted female genitalia into the CG model of the creature. Early concept artwork depicting the showdown between Godzilla and Zilla in Godzilla: Final Wars. In the 1998 film and animated series, TriStar's Godzilla is portrayed as a territorial, piscivorous, 180 feet (54.86 m) tall mutated lizard. Atypical of Toho's giant monster characters, TriStar's Godzilla is not immune to conventional weaponry, and instead relies on its cunning and athleticism to outflank its enemies. It can travel long distances over land and sea, burrow underground and reproduce via parthenogenesis, and is able to lay over 200 eggs, unlike its offspring in the animated series which was unable to reproduce. It possesses an ignitable radioactive breath weapon called "Power Breath", although its offspring could breathe a green atomic Power Breath in the animated series (where also the parent, resurrected as a cyborg called Cyber-Godzilla, possessed a blue version), in which it was pitted against a rogues gallery of original monsters, after the producers were unable to secure the rights to adapt Toho's classic monsters. It was also featured in advertisements alongside the Taco Bell chihuahua. TriStar's Godzilla was featured in the 2004 Toho film Godzilla: Final Wars as "Zilla"; this name would continue to be used and trademarked for later incarnations. A 3D scan of the Trendmasters "Ultimate Godzilla" toy was used as reference for Zilla. In the film, Zilla engages Toho's Godzilla in a battle intended "to show which Godzilla is stronger". Zilla would fight Godzilla again in a slightly longer battle, and even team up with Godzilla to fight other monsters, in the comic series by IDW Publishing titled Godzilla: Rulers of Earth running between 2013-2015. The design and characterization of TriStar's Godzilla was negatively received. Film critic Richard Pusateri of G-Fan Magazine coined the acronym GINO ("Godzilla In Name Only") to distinguish it from Toho's Godzilla. while some fans referred to it as the "American Godzilla". The major points of criticism were centered around the character's radical departure from the traditional Godzilla design, how it was portrayed fleeing from the military, how it did not breathe the traditional atomic heat ray, how it laid eggs, and was killed by missiles during the film's climax, as well as rejecting all the thematic elements, regarding nuclear warfare, of the original. These sentiments were echoed by veteran Godzilla suit actors Haruo Nakajima and Kenpachiro Satsuma, and by Shusuke Kaneko, director of the '90s Gamera films. Nakajima ridiculed the character design, stating: "Its face looks like an iguana and its body and limbs look like a frog". Satsuma walked out of the film, saying "it's not Godzilla, it doesn't have his spirit". Kaneko opined "[Americans] seem unable to accept a creature that cannot be put down by their arms", and later alluded to the character in his film Godzilla, Mothra and King Ghidorah: Giant Monsters All-Out Attack as a monster that Americans mistook for Godzilla. Thomas Tull (producer of Legendary's Godzilla series) criticized the design of TriStar's Godzilla, stating, "I’m always puzzled as a fan when you take things so far it’s unrecognizable." The animated version of the character was more positively received than its live-action predecessor, due to being closer in line with the spirit of Toho's Godzilla, possessing the ability to breathe atomic fire, battle monsters, and withstand attacks. However, the negative response to both Emmerich's Godzilla as well as the Disney remake of Mighty Joe Young released that same year, had caused giant monster movies to fall out of vogue for several years after, with films such as Peter Jackson's King Kong remake being postponed until 2005. Poor merchandise sales for the film led to a cancellation of a toy line based on Godzilla: The Series, and resulted in significant financial losses for toy manufacturer Trendmasters. Various incarnations featured in various media. Left: Godzilla and Baby Godzilla in the 1998 film. Middle: Godzilla and Cyber-Godzilla in the animated series. Right: Zilla in Final Wars and Rulers of Earth. TriStar's Godzilla featured in the game Godzilla Trading Battle. Zilla featured in Godzilla: Rulers of Earth #2. The character has only made two film appearances in Godzilla (1998) and Godzilla: Final Wars (2004) and was vaguely referenced in Godzilla, Mothra and King Ghidorah: Giant Monsters All-Out Attack (2001). A trilogy of films were originally planned, and a treatment by Tab Murphy for Godzilla 2 was written, but the project was abandoned due to the poor reception of the 1998 film and TriStar let their license to Godzilla expire in 2003. An animated television series, Godzilla: The Series, was produced instead and served as a sequel to the 1998 film. 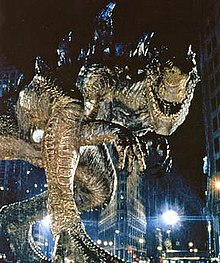 It ran between September 12, 1998 to April 22, 2000 and featured the surviving offspring from the 1998 film as the new Godzilla as well as a reanimated cyborg version of the first Godzilla named "Cyber-Godzilla". For the video games Godzilla: Save the Earth and Godzilla: Unleashed, developer Simon Strange decided not to include Zilla due to the character's unpopularity among fans. Strange received criticism from fans for not including Zilla in Godzilla: Unleashed. In the music video for "Heroes (David Bowie song)" performed by The Wallflowers, TriStar's Godzilla is featured. In the music video for "Come with Me (Puff Daddy song)" performed by Puff Daddy and Jimmy Page, TriStar's Godzilla is featured. In the music video for "Deeper Underground" performed by Jamiroquai, TriStar's Godzilla is featured. The song "No Shelter", by Rage Against the Machine, makes a reference to Godzilla. The song was also featured in the soundtrack for Godzilla (1998). The song "Brain Stew (The Godzilla Remix)", by Green Day, uses samples of TriStar's Godzilla roars. In 1998, TriStar's Godzilla made several commercials and advertisements for Taco Bell, crossing paths with the Taco Bell chihuahua. In 1998, TriStar's Godzilla featured in commercials and advertisements for Edy's and Dreyer's. In 1998, TriStar's Godzilla featured in commercials and advertisements for Sprint Corporation. In 1998, TriStar's Godzilla featured in commercials and advertisements for Kodak Max. In 1998, TriStar's Godzilla featured in commercials and advertisements for Matiz. In 1998, TriStar's Godzilla featured in commercials and advertisements for KFC. In 1998, the film Armageddon features a scene in New York where a little dog attacks Godzilla toys. This was a jab at Godzilla (1998) since Armageddon was in competition with the film at the time of both film's releases. In 1998, a parody of the cab chase sequence from the 1998 film was shown on MTV and featuring Samuel L. Jackson and Christopher Lloyd. In 1998, Discovery Zone featured an event called "Godzilla Laser Adventure" based upon Godzilla: The Series. In the 2005 Robot Chicken episode "That Hurts Me", TriStar's Godzilla was featured in the segment Godzilla Returns. In the 2005 Camp Lazlo episode "Snake Eyes", the TriStar Godzilla's roar is uttered by a snake at the beginning of the episode. In 2006, TriStar's Godzilla was featured in two Doritos commercials. In a 2007 trailer for Spider-Man 3, the TriStar Godzilla's roar is also audibly heard as Sandman dives down from the sand truck. In the 2008 Phineas & Ferb episode "It's About Time", a 100 foot tall T-Rex is shown using the TriStar Godzilla's trademark roar. In the 2009 Iron Man: Armored Adventures episode "Tales of Suspense: Part 2", Fin Fang Foom features the TriStar Godzilla's distinctive roar during the fight with Tony Stark and Gene Khan. ^ a b Mirjahangir, Chris (November 7, 2014). "Nakajima and Carley: Godzilla's 1954 and 1998". Toho Kingdom. Retrieved April 5, 2015. ^ a b Miller, Bob (April 1, 2000). "Frank Welker: Master of Many Voices". Animation World Network. Retrieved March 24, 2018. ^ a b Aiken, Keith (August 17, 2015). "Keith Aiken Facebook". Facebook. Retrieved January 13, 2016. ^ a b c d e f g h Aiken, Keith (May 31, 2015). "Godzilla Unmade: The History of Jan De Bont's Unproduced TriStar Film Part 4 of 4". Scifi Japan. Archived from the original on June 12, 2018. Retrieved September 12, 2016. ^ Fisher, Kieran (May 23, 2018). "'Godzilla' (1998) Isn't As Bad As You Remember". Film School Rejects. Archived from the original on March 3, 2019. Retrieved March 3, 2019. ^ Kalat 2010, p. 222. ^ Kalat 2010, p. 229. ^ a b "Godzilla: Rulers of Earth Interview with Writer Chris Mowry". IDW Publishing. May 23, 2013. ^ a b Oki 2017, p. 205. ^ a b Schaefer, Mark (November 2004). "Godzilla Stomps into Los Angeles". Penny Blood. Archived from the original on February 3, 2005. ^ a b Figurski, Jim; Matsuda, Takashi (August 27, 2004). "Godzilla vs Zilla". Monster Zero News. Archived from the original on October 24, 2005. ^ "Official Documentation showing "ZILLA" to be active, registered, and in effect". Legal Force. Retrieved May 8, 2013. ^ "ZILLA - Trademark Details". Justia Trademarks. Retrieved May 8, 2013. ^ "Trade Mark Serial No. 76669021". Acute IP. Retrieved May 8, 2013. ^ Frank, Matt (May 9, 2013). "Matt Frank on Zilla". Deviant Art. Retrieved September 3, 2015. ^ a b Rickitt 2006, p. 74-76. ^ Ryfle 1998, p. 334. ^ "Godzilla Lives! - page 1". Theasc.com. Retrieved January 22, 2014. ^ "Story Notes for Godzilla". Blogs.amctv.com. April 30, 2013. Retrieved January 22, 2014. ^ Rickitt 2000, p. 174. ^ "Godzilla - Behind the Scenes - FX & Baby Godzilla Costumes etc". YouTube. Retrieved October 5, 2014. ^ "'Godzilla' Returns Home Something of a Stranger - Los Angeles Times". Articles.latimes.com. July 13, 1998. Retrieved January 22, 2014. ^ Molstad 1998, p. 130. ^ a b "The Ultimate Guide to GODZILLA: THE SERIES". SciFi Japan. Retrieved October 5, 2014. ^ "'Godzilla': 5 Things Roland Emmerich's 1998 Version Did Better - TheWrap". TheWrap. Retrieved October 5, 2014. ^ "The Ultimate Guide to GODZILLA: THE SERIES « SciFi Japan". Scifijapan.com. Retrieved January 22, 2014. ^ "Advertising > Animal Mascots > Gidget the Dog (Taco Bell)". Tv Acres. July 21, 2009. Archived from the original on February 5, 2013. Retrieved January 22, 2014. ^ "GODZILLA: THE SERIES- The Lost Trendmasters Toy Line". SciFi Japan. Retrieved October 5, 2014. ^ "Cloverfield: The monster movie Godzilla should have been". Nuketown. Retrieved January 22, 2014. ^ "Staff & Contributors « SciFi Japan". SciFi Japan. May 18, 1998. Retrieved January 22, 2014. ^ Aiken, Keith (March 24, 2006). "DVD Reviews: Godzilla: Monster Edition and Godzilla: The Series". SciFi Japan. Retrieved April 12, 2018. ^ Getlen, Larry (May 10, 2014). "Godzilla is back and bigger than ever". New York Post. Retrieved April 12, 2018. ^ "The US version". Expressindia.indianexpress.com. July 11, 1998. Archived from the original on October 15, 2013. Retrieved January 22, 2014. ^ "Barry's Temple of Godzilla - Godzilla, Mothra, King Ghidorah: All Monsters Attack". Godzillatemple.com. Retrieved January 22, 2014. ^ Graser, Marc (May 6, 2014). "How 'Godzilla' Roared Again with Director Gareth Edwards, Legendary's Thomas Tull". Variety. Archived from the original on February 28, 2019. Retrieved May 11, 2018. ^ Cullum, Brett (July 24, 2014). "DVD Verdict - Godzilla: The Series". DVD Verdict. Retrieved March 1, 2015. ^ "Godzilla: The Series – Review". Japan Cinema. June 5, 2013. Retrieved January 22, 2014. ^ "King Kong::film review". sonic-cinema.com. Retrieved January 22, 2014. ^ Shyman, Jonathan; Aiken, Keith (May 2012). "Godzilla: The Series - The Lost Trendmasters Toy Line". Scifi Japan. Retrieved April 12, 2018. ^ a b Johnson, Bob; Aiken, Keith (March 28, 2006). "The Ultimate Guide to Godzilla: The Series". SciFi Japan. Retrieved April 15, 2018. ^ "Podcast 2.4" (MP3). Tohokingdom.com. Retrieved October 5, 2014. ^ "Podcast 2.3" (MP3). Tohokingdom.com. Retrieved October 5, 2014. ^ a b c d e Weber, Lindsey; Fox, Jesse David (May 20, 2014). "6 Things We Learned About 1998 From the Godzilla Soundtrack". Vulture. Retrieved March 27, 2018. ^ Givens, Ron (May 17, 1998). "A Monster of a Premiere Godzilla Invades New York, Opening Summer Film Season". NT Daily News. Retrieved March 25, 2018. ^ Elliott, Stuart (June 10, 1998). "Marketers sweat a bit as 'Godzilla' disappoints at the box office. Will product tie-ins follow suit?". The New York Times. Retrieved March 25, 2018. ^ "Kodak Max Godzilla Commercial (1998)". YouTube. Retrieved March 25, 2018. ^ "Godzilla (1998) Matiz Commercial". YouTube. Retrieved March 25, 2018. ^ "Actually, the Best Good Bad Movie Is..." The Ringer. June 23, 2017. Retrieved March 25, 2018. ^ LaSalle, Mick (June 4, 1998). "MTV Presents Self-Satisfied Anti-Oscars". SFGate. Retrieved March 25, 2018. ^ "Godzilla: The Series (1998-2000) DZ/Discovery Zone Commercial". YouTube. Retrieved April 17, 2018. ^ "Godzilla Returns". Adult Swim. Retrieved April 17, 2018. ^ "Camp Lazlo - Season 1, Episode 2 "Snake Eyes"". YouTube. Retrieved April 17, 2018. ^ McCartney, Anthony (May 14, 2014). "Who defends Godzilla? Lawyers, of course". The Japan Times. Retrieved April 17, 2018. ^ "American Godzilla Roar In Spider-Man 3 Trailer". YouTube. Retrieved April 17, 2018. ^ "Phineas & Ferb Episode "It's About Time"". Dailymotion. Retrieved April 17, 2018. ^ "Iron Man: Armored Adventures "Tales of Suspense: Part 2" Clip". YouTube. Retrieved April 17, 2018. ^ While new variations of TriStar's Godzilla are trademarked as "Zilla", only the incarnations from the 1998 film and animated series retain the "Godzilla" copyright and trademark. Kalat, David (2010). A Critical History and Filmography of Toho's Godzilla Series (Second Edition). McFarland. ISBN 9780786447497. Molstad, Stephen (1998). Godzilla: The Novelization. HarperPrism. ISBN 0-06-105915-3. Oki, Renji (2017). Godzilla: Monster Apocalypse. Kadokawa. ISBN 9784041061817. Rickitt, Richard (2000). Special Effects: The History and Technique. Focal Press. ISBN 0-8230-7733-0. Rickitt, Richard (2006). Designing Movie Creatures and Characters: Behind the Scenes with the Movie Masters. Focal Press. ISBN 0-240-80846-0.